June 29, 1993, L. G. Crabo. Lophocampa roseata is a true gem because it is both beautiful and rare. 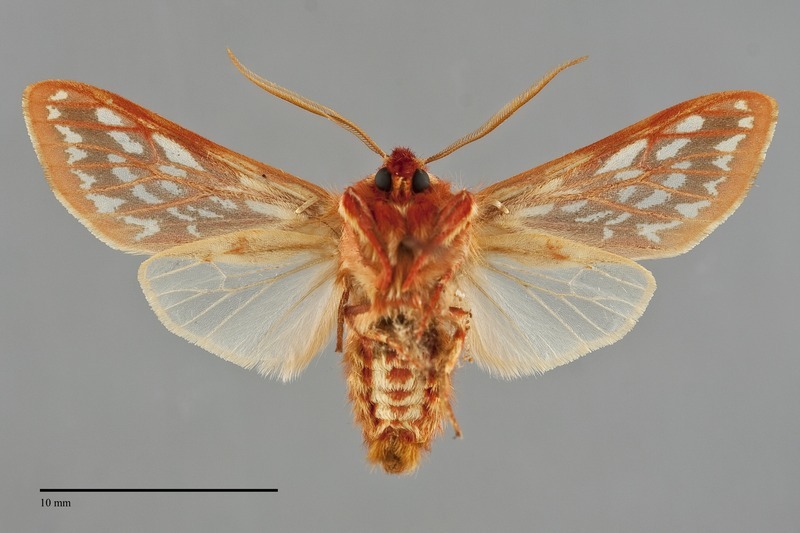 It is a small to medium size (FW length 14 - 15 mm) moth found predominantly in the vicinity of the Salish Sea in our region. 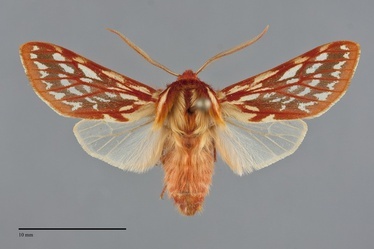 The ground color of the forewing is light yellow, the transverse lines are brown, and the veins are colored bright orange red giving the impression of a bright orange wing spotted with light yellow. The hindwing is translucent light yellow without marks. The head and collar are orange brown, while the dorsal thorax is longitudinally striped with orange brown and grayish yellow. The abdomen is light orange brown, similar to the bipectinate antennae. 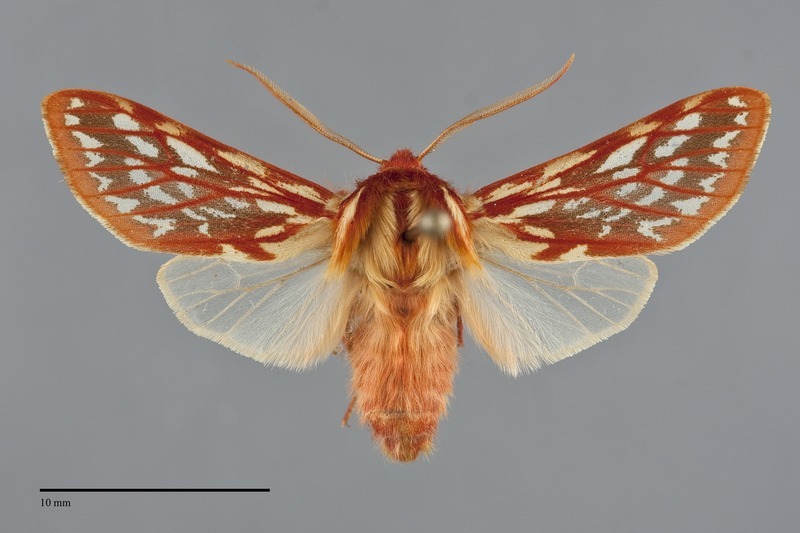 L. roseata is unlikely to be confused with any other moth in our region. The larva is covered with long hairs arranged in short tufts. It is mottled, with colors of orange, white, and black. Two rows of dorsal tufts of mixed black and yellow hairs extent the length of the caterpillar. L. roseata occurs in conifer forest and urban landscapes. Paul Hammond found a larva on a Norway maple on a city street in Astoria, Oregon. L. roseata is restricted to western Oregon and Washington and southwestern British Columbia in the Pacific Northwest. Almost all records are from low elevations in the Salish Sea region (Gulf of Georgia), including Vancouver Island, the lower Fraser Valley and adjacent northwestern Washington, and the San Juan and Gulf Islands. An isolated record exists from Clatsop County, Oregon. This species is has a disjunct distribution. It occurs in the central and southern Rocky Mountain region outside of the Pacific Northwest. A larva was found feeding on exotic Norway maple (Acer plantanoides) in Astoria, Oregon. Adults are single brooded and occur in mid summer, with most records from July. It is nocturnal and comes to light.